This entry was posted in Libertarian Party and tagged Augustus Invictus, Florida on September 6, 2015 by Caryn Ann Harlos. It was an extremely successful meeting, with a renewed spirit of unity and commitment. This entry was posted in Libertarian Party and tagged adrian wyllie, Libertarian Party of Florida on June 8, 2015 by Jill Pyeatt. Adrian Wyllie, 2014 Libertarian candidate for Governor of Florida, continues to attract media coverage for his protest of the REAL ID Act. This entry was posted in Libertarian Party on March 4, 2015 by Andy Craig. A federal judge Tuesday rejected arguments by Libertarian gubernatorial candidate Adrian Wyllie that he should be allowed to take part in a debate Wednesday night with Republican Gov. Rick Scott and Democratic challenger Charlie Crist. This entry was posted in Libertarian Party and tagged adrian wyllie, charlie crist, Florida Governor, florida libertarian, Rick Scott on October 15, 2014 by Vincent Rivas-Flores. Republican polling firm 0ptiumus has released a survey showing Libertarian nominee Adrian Wyllie climbing to 13% in the Florida governor’s race. This entry was posted in Libertarian Party on October 9, 2014 by Jed Ziggler. PLEASE TRY TO SHARE THIS IN MANY MAINSTREAM PLACES WHERE THE LIBERTARIAN MESSAGE IS NOT USUALLY HEARD. I WANT TO LEVEL THE PLAYING FIELD. THEY HAVE $5M COMPARED TO MY $20K, BUT THE PLAYING FIELD IS LEVELED AT THE DEBATE PODIUM. This entry was posted in Libertarian Party and tagged Adrian Wylie, Bill Wohlsifer, Libertarian Party of Florida on August 31, 2014 by Jill Pyeatt. Counting Down the Final Week of a Successful Craft Brew Tour! This entry was posted in Libertarian Party on August 22, 2014 by paulie. 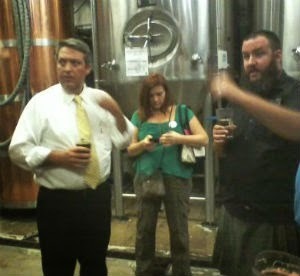 Wyllie and friends tour the brewery. This entry was posted in Libertarian Party on August 15, 2014 by paulie. This entry was posted in Libertarian Party on July 29, 2014 by Jed Ziggler. A new Quinnipiac University poll, not only included Adrian Wyllie but shows him polling at 9% in a 3 way race with Rick Scott and Charlie Crist. This entry was posted in Libertarian Party on July 23, 2014 by paulie.